When Merritt Island is discussed in baseball circles, the name that comes up almost immediately is staff ace Mason Denaburg. The big right-hander is expected to go high in next week’s Major League Baseball draft, and has a fastball that sits in the mid-90s. What isn’t talked about much, however, is the Mustangs offense. On Wednesday afternoon, the offense reminded everyone that they are just as big a part of this current state run the Mustangs are on. 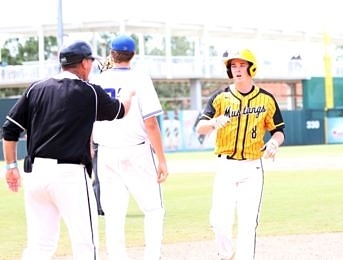 Merritt Island’s RJ Diaz had three hits and three RBIs, and the rest of the offense chipped in for an 8-2 6A semifinal win over Barron Collier. 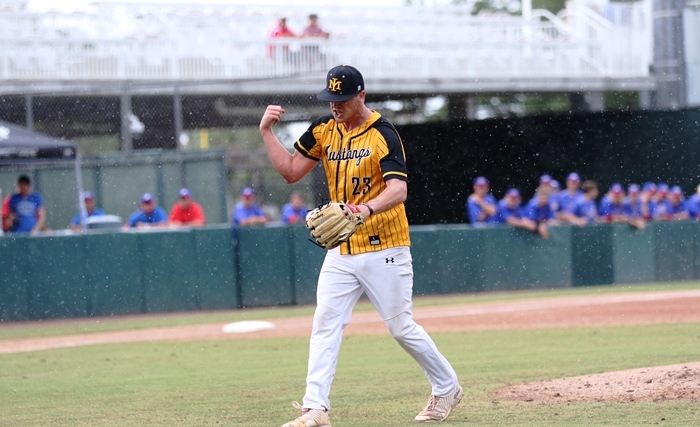 Denaburg, who was coming off his best outing of his career in the regional finals, a 2-0 win over perennial state power American Heritage, was not himself on this day, but even at less than 100%, he was dominant. 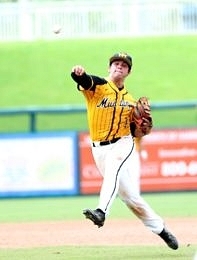 The Mustangs ace scattered five hits, while striking out 13. For Barron Collier, they had spent the past week looking at videos of Denaburg, and what they were expecting was different than what they saw. Despite the speed reprieve, Denaburg was able to dig down each time the Cougars mounted a rally. In the first, Long singled in Marcus O’Malley with the games first run. With runners on first and second, Denaburg got Matt Lord to pop out. Then, in the third, after walking Cliff Soukup and Connor Phelan, the pair moved to second and third ona wild pitch. Denaburg proceeded to strike out the next two batters, ending the threat. In the fourth, Barron Collier again threatened, scoring one run, and cutting the lead to 4-2, on a double down the right field line off the bat of Phelan. “I knew he was going to come in hard, and I was able to hit it down the right-field line,” said Phelan. Again, Denaburg worked out of the jam, striking out his pitching counterpart Nick Denove. The frustration was mounting for the Cougars. The tight game early played right into the hands of Merritt Island, who comes out of one of the toughest districts and regions in the state. The comfort level of getting through that gauntlet showed Wednesday, as for most of the day the Mustangs played loose and in control. When they finally broke the game open with three runs in the seventh, the attention turned towards the state championship game against Jefferson. “We are just going to go celebrate this one for a while, then go back to the hotel and start getting ready for tomorrow,” said Denaburg. This state semifinal will be one the Cougars look back on and think of the what-ifs. “When you are facing a Major League caliber arm, you can’t make the mistakes we made early in the game defensively,” said Maurer. Still, the team that has reached the semifinal game in two of the past three seasons, believes they are prepared for a sustained run.